I found myself sitting at my kitchen counter looking at a delicious cheeseburger from In-N-Out. All I could think of was, “GET IN MY MOUTH” (Insert: “That’s what she said” if you like). I purposefully planned to eat this fast food gift of the gods as my last meal before my trip. Why? Because I was going to live meat free for the next 10 days in Nicaragua. You would think that after spending a week and a half at a place called “The Hand and Heart Yoga Retreat” that I’d return as a full-fledged “vegan yogi who can sense your bad aura.” I thought I would. Instead I was treated to an eye-opening experience of community, openness and compassion…in a gorgeous tropical backdrop. During my time there we did yoga, yes, but we also painted school buildings for local children, stayed in a TREEHOUSE IN THE JUNGLE and had two hours a day of meditation/dharma discussion. I was excited to get some peace and quiet and maybe shed a few pounds in the process. In fact, that was one of the main reasons I wanted to go – to experience a “healthy” lifestyle. However, by the end of my trip, my body image was the farthest thing from my mind. This is what I mean by “Nicaragua is a beautiful country.” I hope you agree. Nicaragua is a beautiful country, but there were three things I had to get used to when I arrived in Granada, Nicaragua: 1. Waking up at 5:30am. 2. the combination of cars and exotic birds chirping away in unison and 3. mosquitos. I had to brace myself every morning before leaving my comfy, cool hotel room, because as soon as we left the hotel we were greeted by the dense tropical heat. After the newness of the first day, we were whisked away from our morning yoga session to a small village outside of Granada. I was amazed at how deserted the landscape looked as we drove farther from the city. The buildings were replaced with little shacks until we arrived at our destination – three houses lined up in a row. This was their school. I was fascinated by the looks we got from the school kids. We were all sweating in the heat, but the uniformed tweens standing around gossiped without a drop of sweat. I was amazed to see how different the school was from what I imagined. The windows were steel bars and the hodge-podge of mismatched desks must have been donated furniture. I wondered how these kids could learn in this heat and these conditions. The kids didn’t seem to mind at all. We finished painting all the buildings as the school day was ending. Then we were told about the second part of our day – participating in an after-school program. See, most of the kids would return home to empty houses because their parents had to work late. So this program was created to keep them occupied and ensure someone watched over them. We separated into three groups: a soccer group, yoga group, and arts and crafts group. I was in the arts and crafts group, but got to enjoy all the kids’ company. They’d rotate every 40 minutes so they could try all the activities. 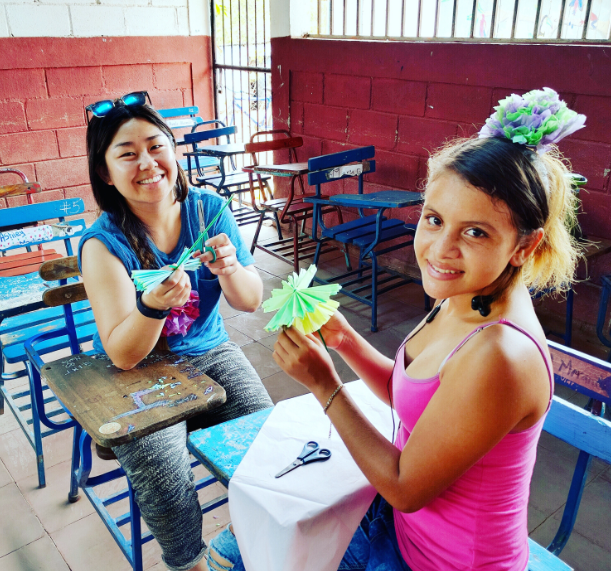 We made paper flowers out of colored tissue paper and pipe cleaners – the kids loved it, even the boys. They would tell me they were making flowers for their “mama” or “novia/novio” (girlfriend/boyfriend) which caused our group to cheer or break out into laughter. I couldn’t help but think how amazing it was to see these kids without cell phones or iPads having so much fun. It made me think that maybe I didn’t need to spend so much time on my phone and instead focus on the moment at hand. Despite the heat, I slept great that night. After exploring most of Granada through walking tours and kayaking, our group packed up and headed to The Aqua Wellness Resort. This place was more than amazing; it was paradise. My room was a tree house that overlooked the Pacific Ocean…A LITERAL TREE HOUSE! 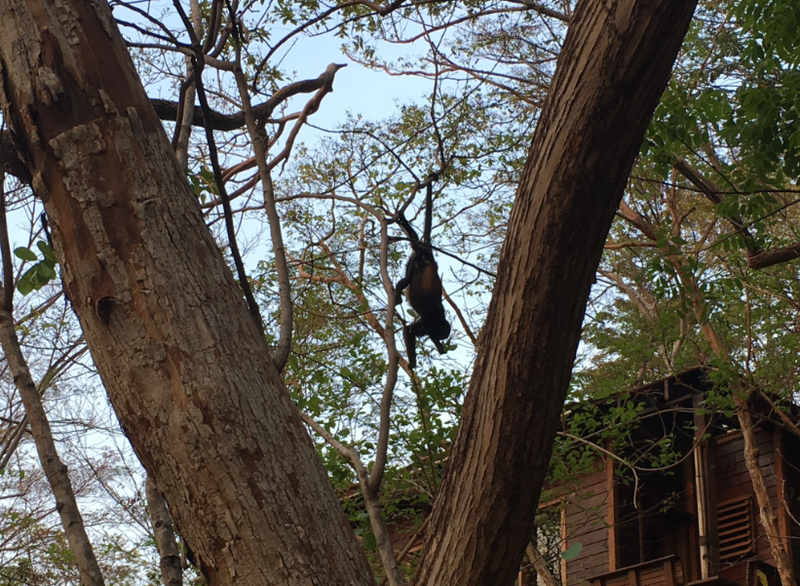 The coolest part of the resort was all the animals and creatures living among us – especially the spider and howler monkeys! The serene setting really gave me the chance to hone in on yoga and meditation. Our schedule consisted of 2 hours of yoga in the morning, 2 hours in the afternoon and 2 hours of meditation/dharma discussion in the night. Even though the days were very busy, I oddly felt at peace and relaxed…maybe it was the fact that we were living at the beach or eating fresh and local veggies and salads, or being around the people from all walks of life. During our discussions it was incredible to hear all the different perspectives on spirituality and death. Talking about such heavy topics really brought our group together and made us feel like a family. The fifth stood out for me, though. Of course we were having a bonfire and were tasked with writing down a thought we were ready to let go of before tossing it in the fire as an actionable symbol of letting go (I know, I know…cliché). The most profound part came after the ritual. The fire was dying and a few of us stayed behind lying on the sand soaking in the starlight. I asked one of the other girls if she thought we were losing any weight. It was the first time it crossed my mind since being there. Which was weird because it was so important to me before I left. She paused and responded after a while, “Huh…I guess we did?” I actually don’t know if I lost any weight at that point, but I know I felt better about my body. In fact I hadn’t thought about my weight or body at all. How I think my stomach isn’t toned enough or how my thighs don’t have a big enough gap. Instead I thought about things like “is my chutarunga better today? And will my balance be better? ”For the first time since I was a kid, I was comfortable in my skin and unconcerned if I looked “fat” in my bikini. That’s a monkey. And a tree house. And awesome. Maybe it was that there was only one mirror in the whole resort (near the bathroom above the sink so I could only see if there was toothpaste on my face in the morning and at night.) so I was stuck only knowing how my body “felt” – and it felt good. 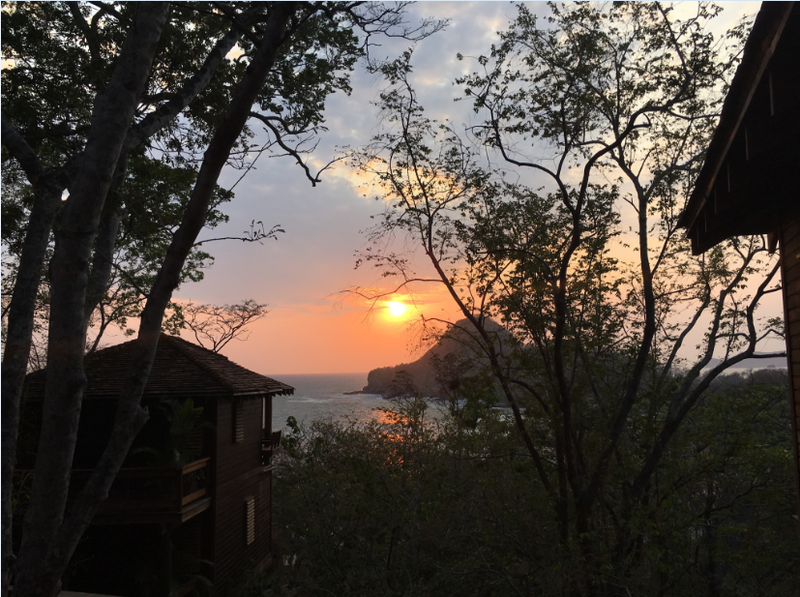 I went to Nicaragua hoping to lose weight and chill in the jungle, but instead picked up some positive body vibes, enjoyed incredible fresh foods and experienced reflection and utter acceptance from everyone. I discovered a woman who was confident in her own skin – that feeling we all have as children and eventually lose by our teenage years when we are obsessed with boys, acceptance and image. 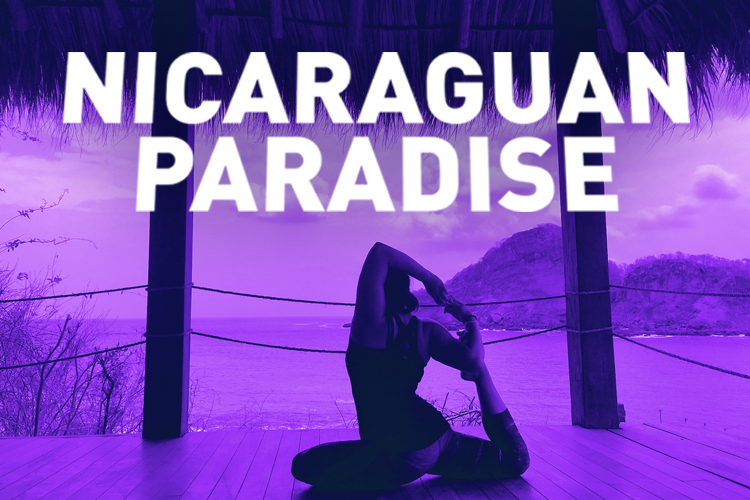 The Hand and Heart Yoga retreat and Nicaragua both have a special place in my heart. It was there where I met amazing people, found a new definition of compassion, and began a new routine of health, happiness, and a sense of peace that I will always carry with me. And FYI, as of this writing, I had In-N-Out yesterday. It was delicious. Written by: Hannah Rosales on June 6, 2016. Last revised by: Levi HarrisJuly 19, 2016.